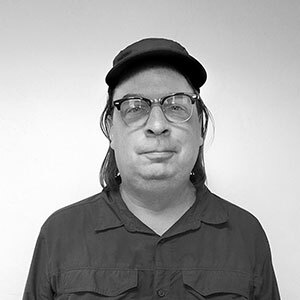 Tom Baumgartner is an artist and designer living in Tucson Arizona. I'm interested in an ancient/future aesthetic that frames the unknowable history of a place and it’s unknowable future. I like mystery. I like mysterious symbols. I like the futuristic feel of ancient glyphs and the ancient aspects of our modern symbol making. In the digital age of computer interface, symbols embedded in natural scenes hint at an underlying structure, invisible forces, and human influence. Tom has painted in oil and drawn with ink for 30yrs with a BFA from the School of the Art Institute of Chicago. He has lived in Tucson for 19yrs and been actively involved with local arts organizations as well as founder of Wee Gallery. A life-long nature lover, his art has a focus on the desert landscape, automatic writing, and aesthetics of science. Tom is currently Creative Director for AlphaGraphics in Tucson. In my 20's, I was a renovation carpenter. Sometimes there was less than interesting work to do. On one particular day I had to clean out a basement furnace room to prepare for new heating equipment. The 12' x 12', brick-walled room had a concrete floor with a center drain and one lightbulb hanging from the ceiling. If you know old basements, the mortar between bricks will calcify over the years and any disturbance in the air will set strings of cobwebby calcium dust into the air. This room hadn't been entered in decades but had managed to collect a foot of sludge, discarded lumber, and trash. Alone in a dirty cell-like room, I pondered my place in the world, and tried not to get too depressed. It took me a couple hours to shovel the stuff and wheelbarrel it outside. I used a broom on the brick walls and spent some time hosing the place off. The whole room was starting to look transformed and I stopped to inspect my work. The elephant head of the Hindu diety Ganesh smashed through one of the brick walls. The pink-eyed albino, had intricately detailed, ruby encrusted jewelry adorning his tusks, trunk and dribbling off his fringed headpiece. Globs of molten gold bounced and rolled onto the wet concrete floor spitting steam trails as if the metaphysical friction of breaking through the wall had encouraged golden ectoplasm. The vision had lasted a split second. This is the process of my artwork. I garden a fertile subconsious and then wait for it to 'flash' an image to me. Daydreaming is on my "To Do" list everyday. In the last couple years I've been concentrating on inking technique and exploring handmade book technology.